What is SI joint Dysfunction? What does SIJ Dysfunction mean and how does it affect me? 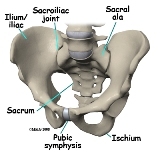 SIJ – stands for the sacro-illiac joint, and is the joint in the pelvis between the sacrum (lowest part of the spine) and the ilium (pelvic bone). There are actually two SI joints, located either side of the sacrum. There are a number of strong muscles and ligaments that surround the SI joint. The muscles that surround the SI joint don’t actually act directly to produce active movement of the joint as its primary function is to act as shock absorber and transmit forces from the upper body and spine sideways into the pelvis and then into the lower limbs. Alteration in the normal motion of the SI joint will result in pain. This can be too much movement (hyper-mobility) and too little movement (hypo-mobility). People that have suffered from SI joint dysfunction know how excruciating it can be and how it can manifest itself in the low back, the hip, and even down the leg. It can make simple daily activities such as getting in and out of a car; turning over in bed; standing up from a sitting position difficult and troublesome. A common example of SI joint hyper-mobility is during pregnancy as the muscle and ligamentous structures stabilising the joint get affected due to altered hormone levels. The hormones released during pregnancy relax the ligaments of the body to allow the pelvis to enlarge, in preparation for childbirth. Due to the growing uterus, some of the core muscles around the pelvis get ‘stretched’ and weakened. The additional weight gain and altered gait lead to an increased mechanical strain on the SI joints which may cause pain over the joint and can manifest itself as low back pain, hip pain or even sciatica. Hypo-mobility can result from direct trauma to the joint, such as a fall onto the buttocks, motor vehicle accident or even as simple as missing step when walking downstairs. Abnormal movement from sports can directly injure the SI joints by stretching/straining the SI ligaments. Our Osteopaths treat this condition by working on the soft-tissue and ligamentous structures around this joint, along with joint mobilisation and manipulation. This can often give immediate relief. We would also work on optimizing your posture and working on your core and hip stability. Appropriate self management advice would also be given. “I have been under Neelam’s care since Neelam arrived at the clinic in 2011. I continue to be impressed with Neelam’s ability to quickly diagnose and treat my back and neck issues. Recently I had an elbow operation and Neelam’s work on the rehabilitation and recovery has also been first class whereby even the surgeon was impressed! “Helen has taken care of my podiatry needs for over 10 years. I cannot recommend Helen highly enough as an outstanding expert with great skill in treating often complex foot issues. “I have been seeing Eric weekly for the last year and his skills have made an amazing impact on my overall health. He has helped me recover from ligament damage after a broken arm, chronic lower back pain and even a numb toe. His approach to healing is holistic and he always educates his patients about the many contributors to their pain or ill health, whether they be poor posture, diet, metabolism or an injury to another body part. Seven members of my extended family have been to see Eric, for various physical ailments, and he has done them all the world of good. In fact, the main thing that my son misses about Singapore is Eric; as a keen soccer player he has sought help from Eric in dealing with injuries and now that he is at university in Canada, he laments the fact that he can’t find anyone with the same holistic approach to rehabilitation. He recently said “I’ve found a physiotherapist here, but he’s just not like Eric”.